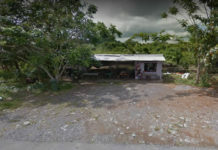 When looking for specialty, Dayak food in Kuching is a gaining popularity and several places have emerged in town serving the best of such cuisine for tourist and locals. 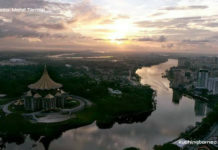 In general, Dayak food is divided into the Dayak Bidayuh cuisine and the Dayak Iban cuisine. Both may seem similar, but the method of preparation and cooking might slightly be different. Best served as dinner, Dayak food does feature a lot of meat with pork and belacan (shrimp paste) taking center stage most of the time. As a Dayak person myself, I love Dayak cooking, but preparation of such dishes can be rather tedious. On top of that, I’ve been asked by tourist quite often about what Dayak food is served, and where it is served, so here’s a list of popular Dayak dishes I can write about for now, with an idea of where you can get them. Known better as ‘Midin Belacan’, this dish is interestingly only found in Sarawak for a reason I do not know. 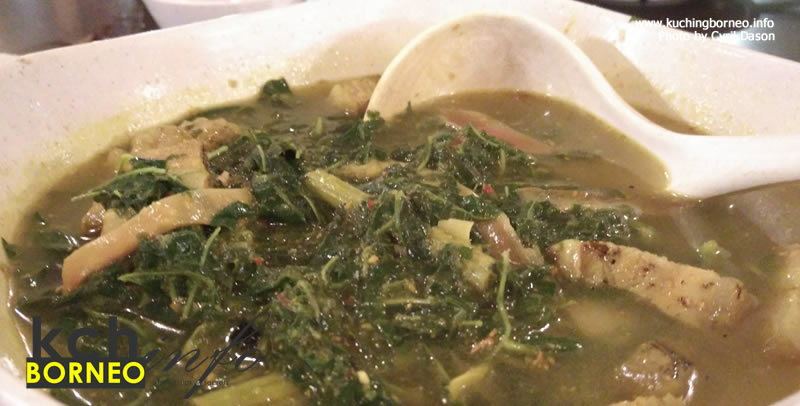 The dish usually features wild ferns stir fried together with shrimp paste which has been pounded together with garlic, red onions and sometimes anchovies. 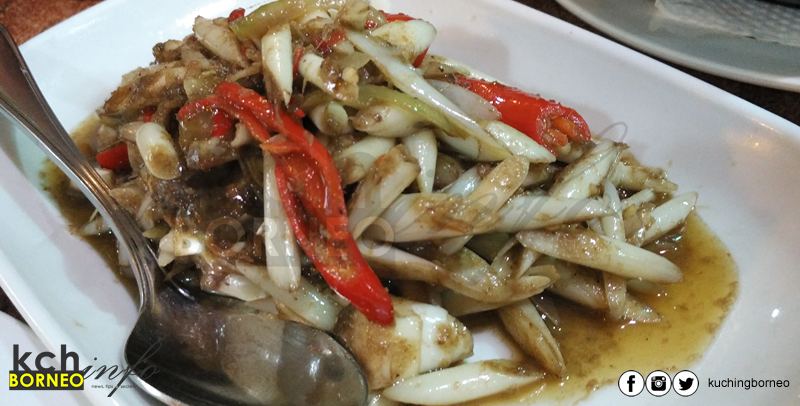 This signature dish is known across Sarawak and is sold in most dinner seafood outlets. Known best as ‘ Ayam Pansuh’, chicken cooked in bamboo is sort of like the signature dish for Dayak cooking as it’s well accepted by the masses, and is typically halal. 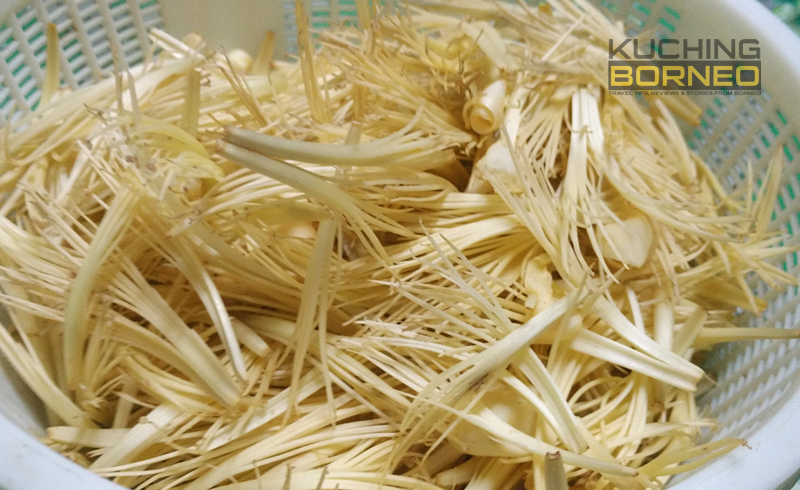 The dish is usually cooked by putting chicken and water in a large bamboo together with seasonings with tapioca leaves is used to cover the bamboo while the meat gets cooked. You can also get the pork version of this dish Awah Cafe in Stutong, but almost all Dayak stalls do serve this dish. 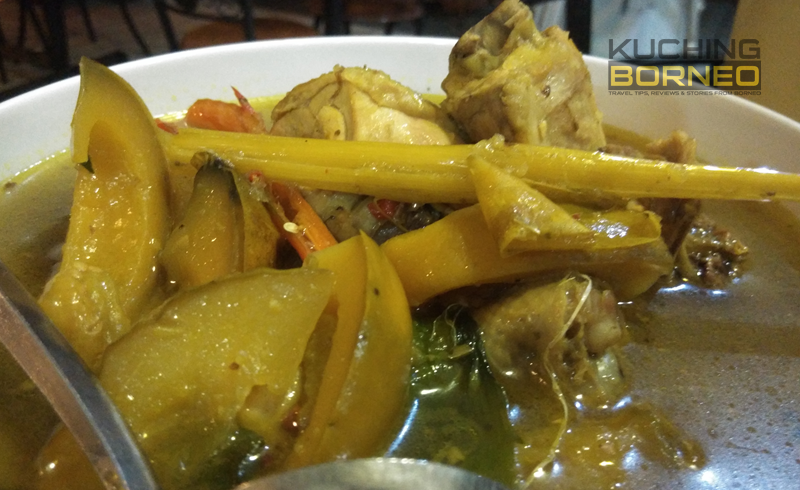 Popularly known as Ayam masak Tempoyak locally, this dish could give you a mixture of taste when eaten. 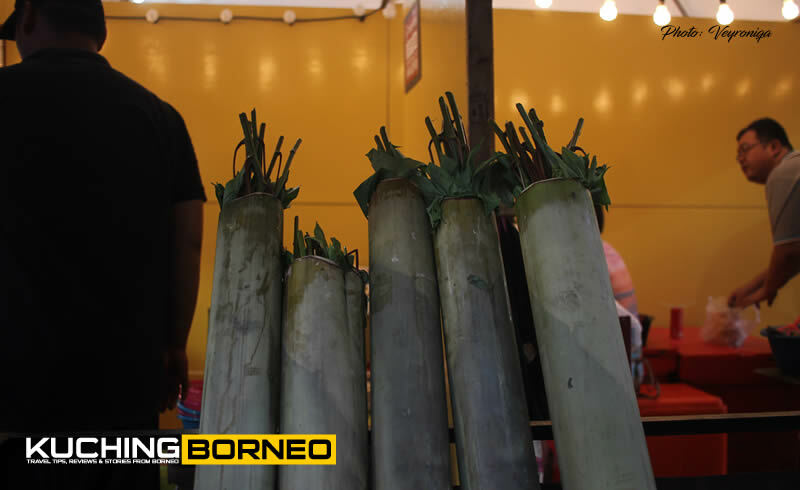 Depending on the cook, it can become sour or sweet which is largely due to the choice of Tempoyak (fermented durian) used. This dish usually taste best if chilies are included in the ingredients and it can be found at Lepau Restaurant. If you are however interested in the non-halal version, try Entangen Cafe. Dayak Brinjal can be cooked by itself, but it’s best served when combined in a soup as it gives that slight sour tinge to the dish. For Dayaks, cooking chicken or any meat (particularly pork and fish) with Terung Asam (Dayak Brinjal) is something typical as a mixture of lemon grass, onions, and Dayak brinjal combine with the taste of the meat to produce something quite magical to the taste buds. Durian flowers make a very delicious dish but unfortunately, it can’t be found year round and is only available during Durian season. It’s unfortunate considering I love this dish, but that nly makes it even more special. This dish is cooked by stir frying the processed Durian flowers with anchovies and shrimp paste (belacan), providing you with something quite unique compared to the typical greens one usually have. Not sure where you can get this as I have not come across a shop serving it. 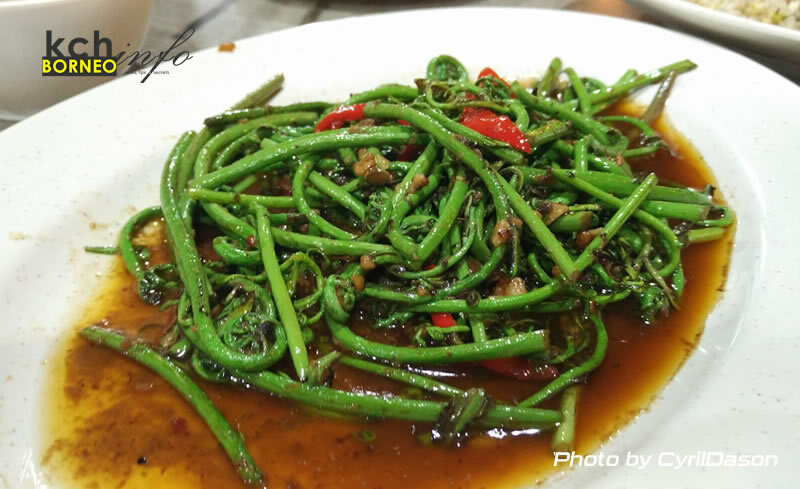 A popular simple local vegetable dish which is served in almost every Dayak restaurant is Stir Fried Tapioca Leaves. 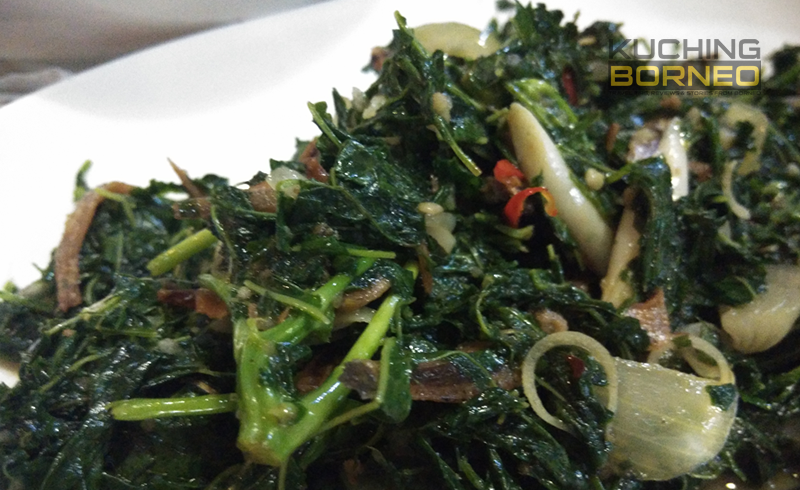 Cooked by frying the tapioca leaves in a mixture of onions, anchovies and sometimes tepus, this dish is not only easy to do, but also very tasty. When not cooked, Tepus, a plant originating from the ginger plant family, smells very strong, and it has a very distinctive taste if eaten raw, or even when cooked. That’s where shrimp paste (belacan) comes in as the combination of these two very strong flavours somewhat allows this dish to come out quite unique. Best eaten with rice, stir fried tepus with shrimp paste isn’t easy to find in shops as tepus itself is quite pricey these days. 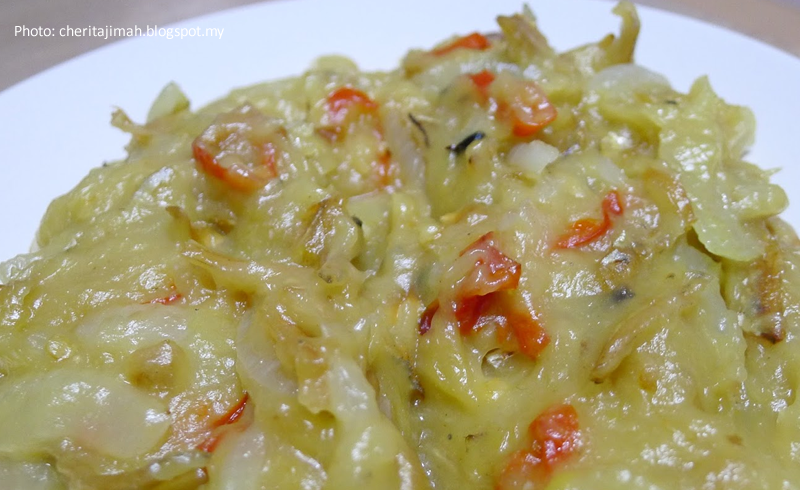 Fermented Durian, better known as Tempoyak, is a very important ingredient in Dayak cooking, and used in almost any way possible for servings, and it is also best served fried with a mix of sugar, anchovies, chilies and onions mixed together. This dish is hard to come by in local stores around Kuching, but a Dayak place called Entangen does serve it. Personally, when this is served, I would double my food intake and I can eat this with just rice. Yum! 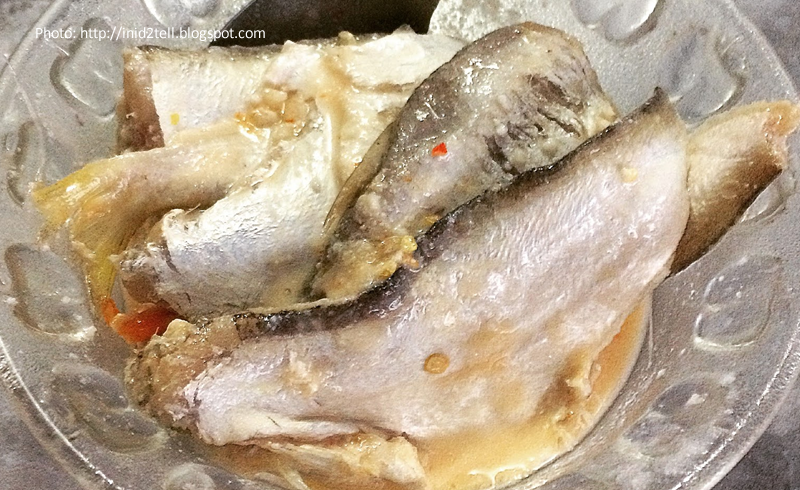 One dish that I have never got over is fermented fish, popularly known as ‘kasam ikan’. It is eaten raw with lime and chilies. However, in some cases, this dish is cooked by just stir frying it, but one must prepare for the strong smell that comes with it’s preparation. 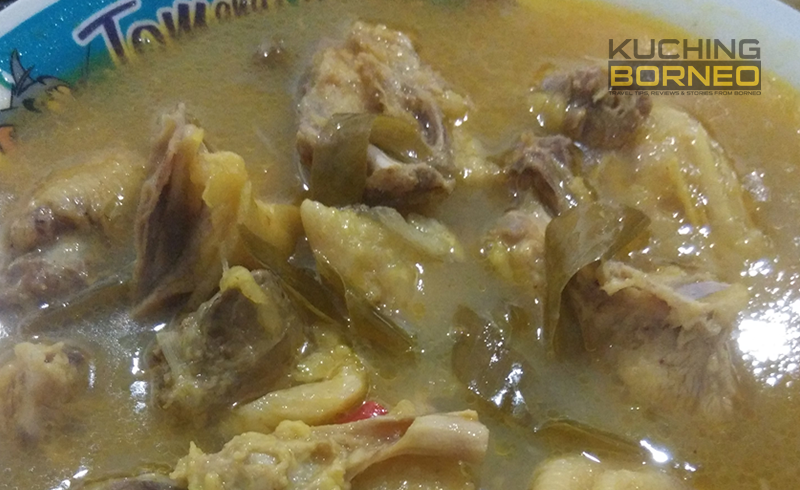 Aside from kasam ikan, there’s also ‘kasam babi’ which is fermented pork which taste equally delicious. Best ate in moderation, kasam is best eaten with rice and can be found at Awah Cafe. 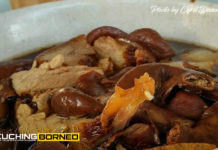 Since most Dayak food features pork, getting an authentic one that is pork-free is largely difficult, but Muslims can head on to Aroma Cafe to enjoy the few signature ones such as Ayam Pansuh (Chicken cooked in bamboo), Ayam masak Terung Asam (Chicken cooked with Sour/Dayak Brinjal), Tepus Belacan (Tepus with shrimp paste) and Stir fried tapioca leaves. Previous articleHow to Amaze Your Professor with a Brilliant Dissertation of Yours?